So here is what I prepared last week on the occasion of “Janmashtami”. I know if I had put this up 2 weeks earlier, at least somebody here may have taken it as a chance to try these out. 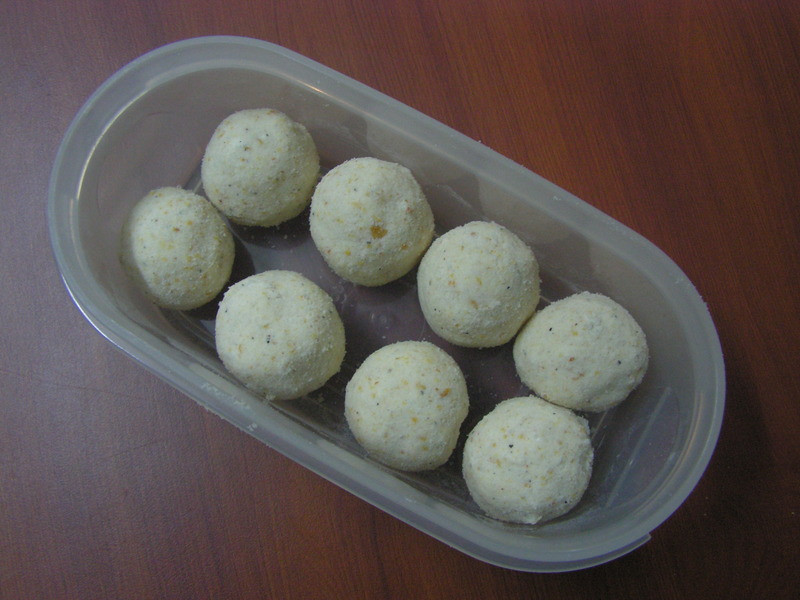 Anyway, these Laddoos now add to the long list of laddoos on this blog. 2. 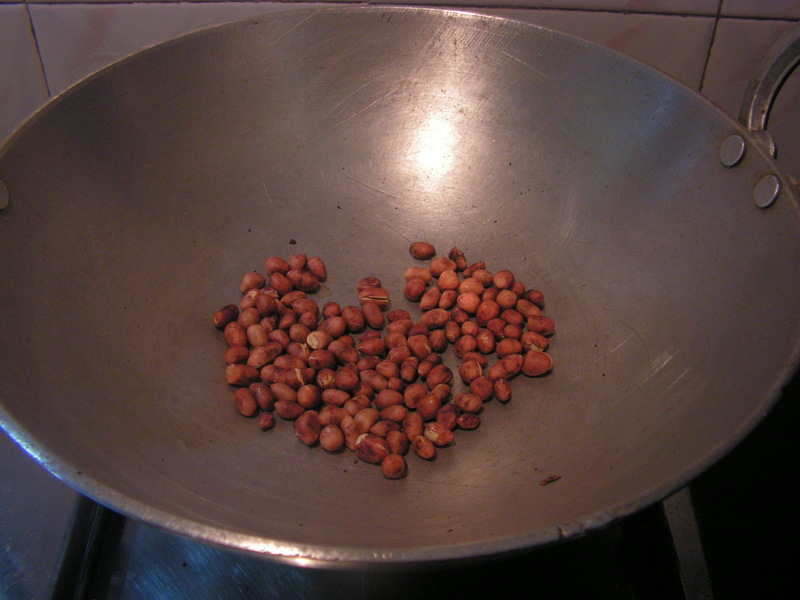 Place the same kettle and roast peanuts till you get a pleasant aroma you are able to peal out the nuts. On cooling peal it and keep it aside. Peel cardamom too. 3. Roast grated copra on lo flame till crispy and you get a pleasant aroma. 4. 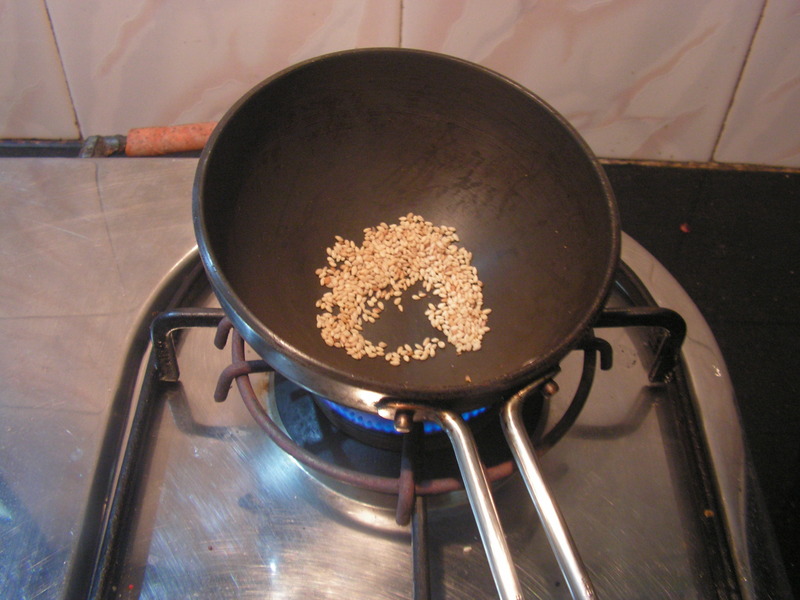 Place a spatula and roast washed and drained sesame seeds till it splutters. 5. 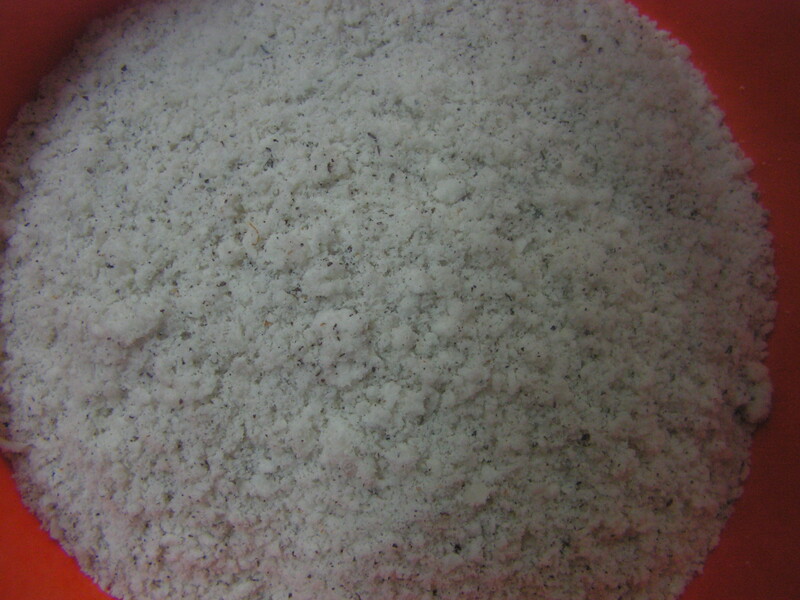 Place a spatula and roast poppy seeds in it till it changes the colour and oozes out a pleasant aroma. 6. 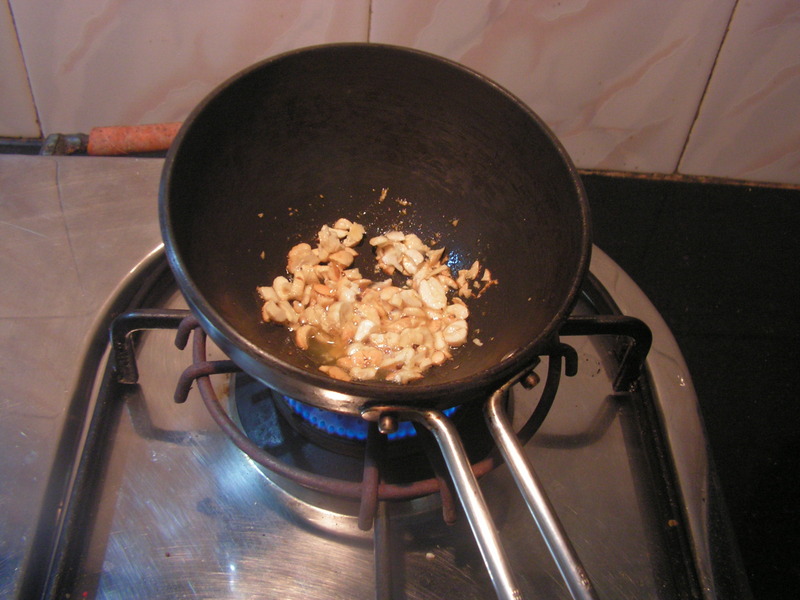 Place a spatula with 1/2 teaspoon ghee in it and when heated add chopped cashews in it and fry till done. 7. 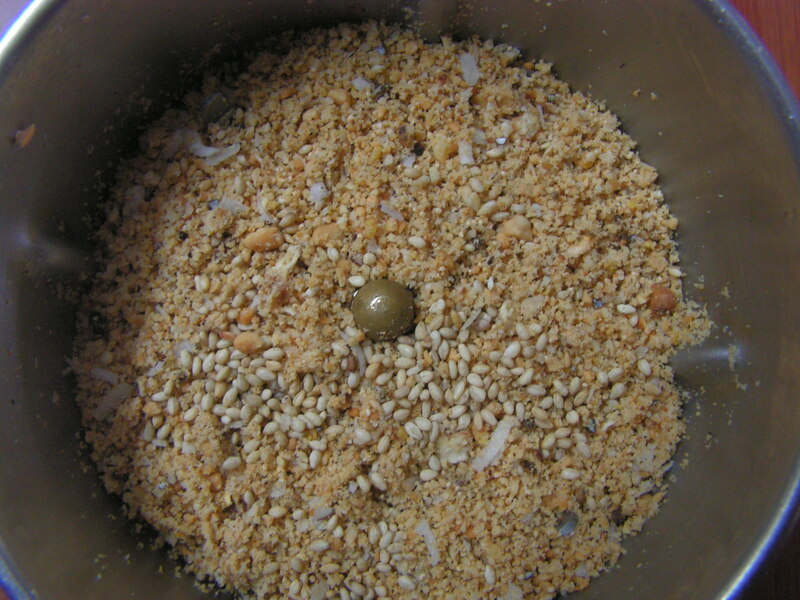 Powder roasted peanuts, copra, poppy seeds, cardamom into a coarse powder in the mixer. Just add roasted sesame and also grated dates and mix it to the powder. 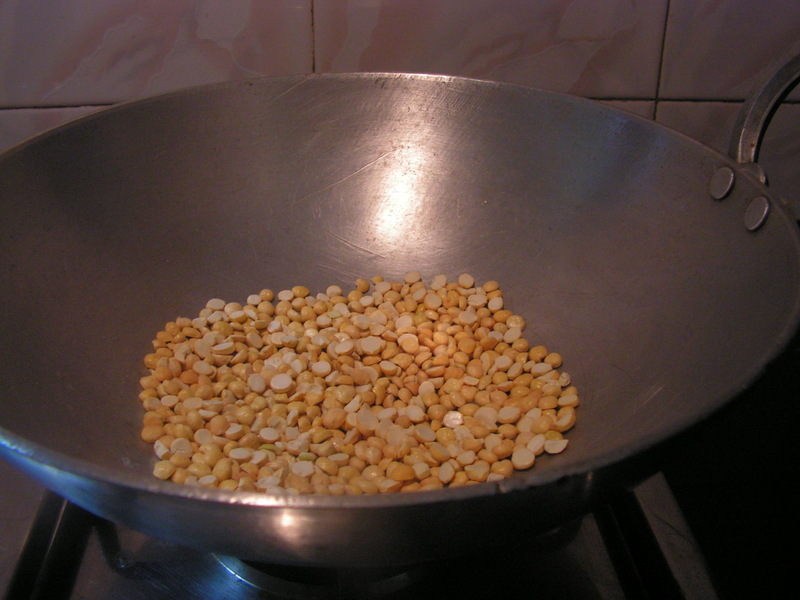 Also powder roasted Dalia dal in the mixer and sieve with Thambittu. 8. 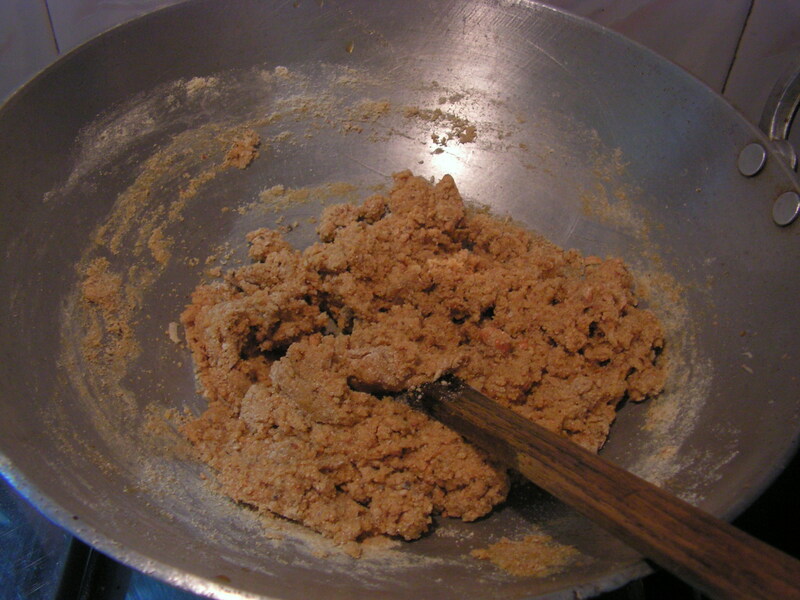 Just transfer the laddoo mix to a plate for a closer view. 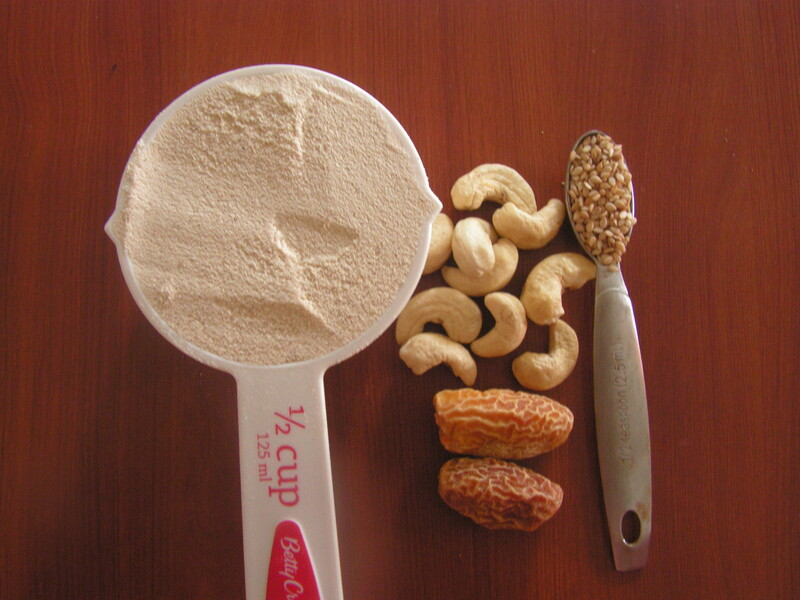 This includes thambittu- dalia dal powder mix, and the powder from step-7 and roasted cashews. 9. 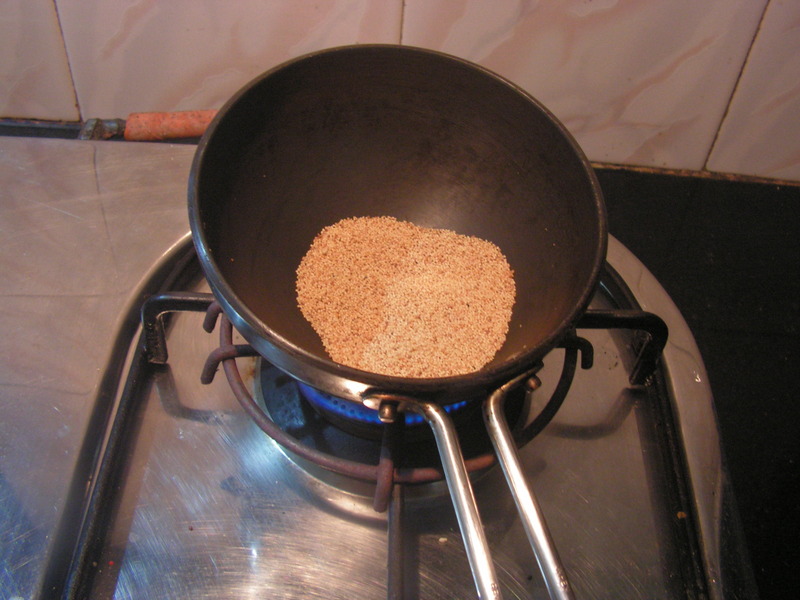 Place a skillet with grated jaggery in it and add 1/3 cup water to it and bring it to boil on medium/low flame. Just strain it on a cloth to get rid of any fine mud articles which is usually fine in jaggery. Bring it to little less than even 1 string consistency and just before switching off add 2 teaspoons of pure ghee and stir it well, switch off the flame and add the laddoo mix from step-8 to it and give a strong stir till it is evenly mixed..
10. 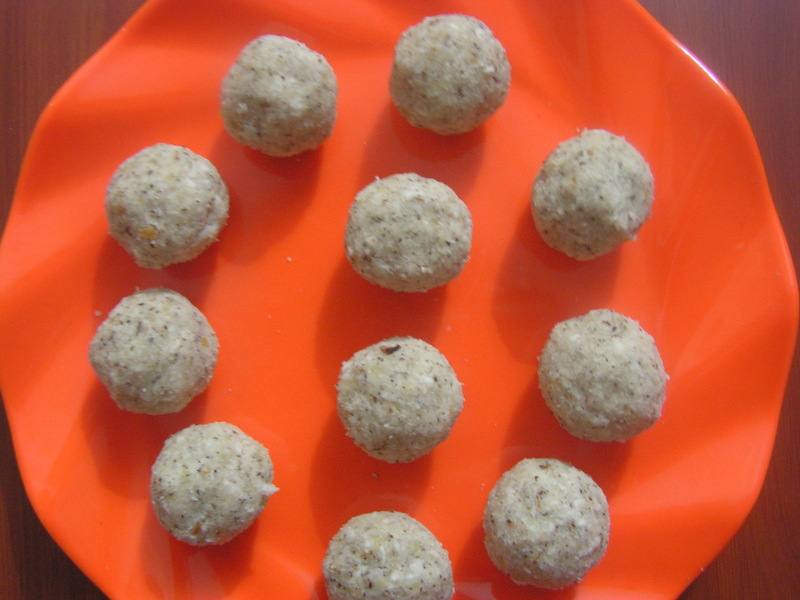 Make round laddoos applying a little ghee to your palm of required size and will be medium hard in consistency in a span of 10 hours at room temperature. You can transfer it to an air tight container after cooling. These laddoos are really yummy !!!! 1. 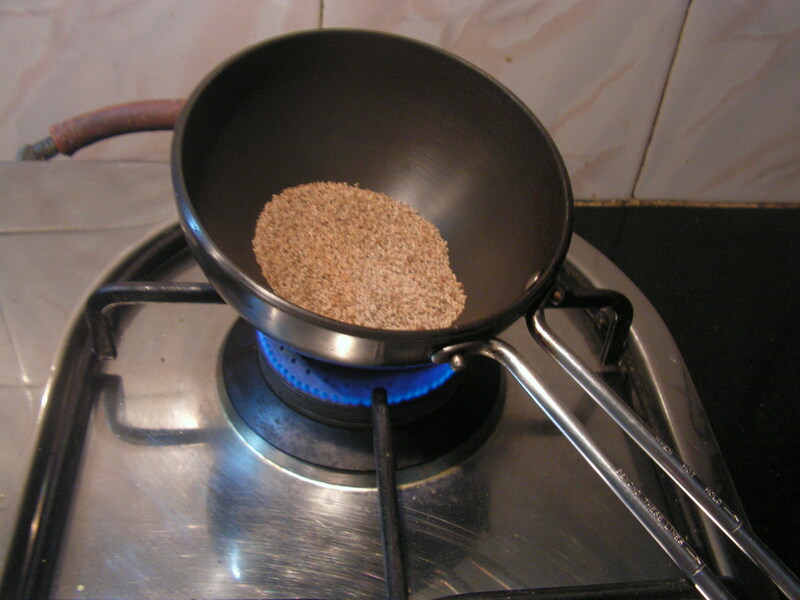 Thambittu need not be roasted as it is already available roasted. 2. I have added grated dry dates as additional dry fruit to make it tastier. One can even add walnuts, pistachio if at home. 3. I have mixed 2 different varieties of jaggery for the syrup. Using only chikki jaggery would render the Laddoos too hard. 4. Again Dalia dal powder helps make the Laddoos soft enough for a bite rather than broken with a mortar and pestle. 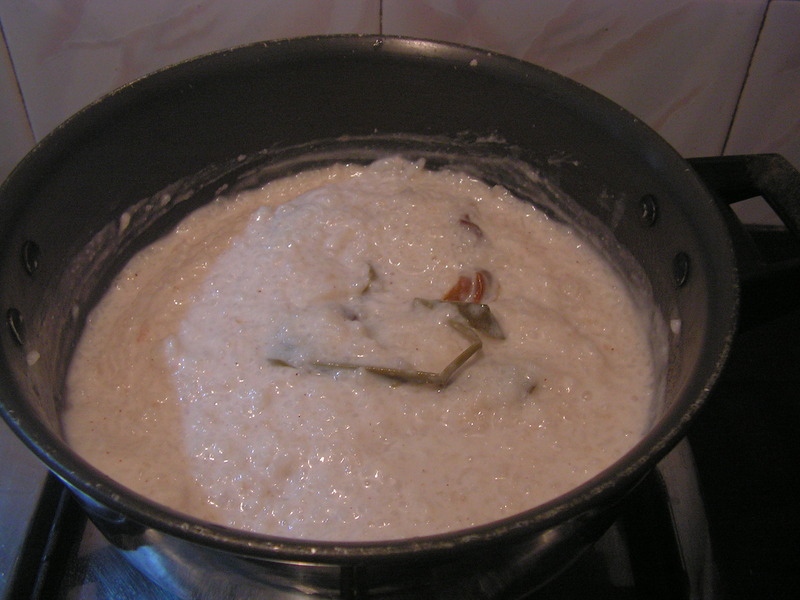 Because of the interaction between the jaggery and the sticky rice atta and the dal, you may have to try minor change in proportion to get this perfect. 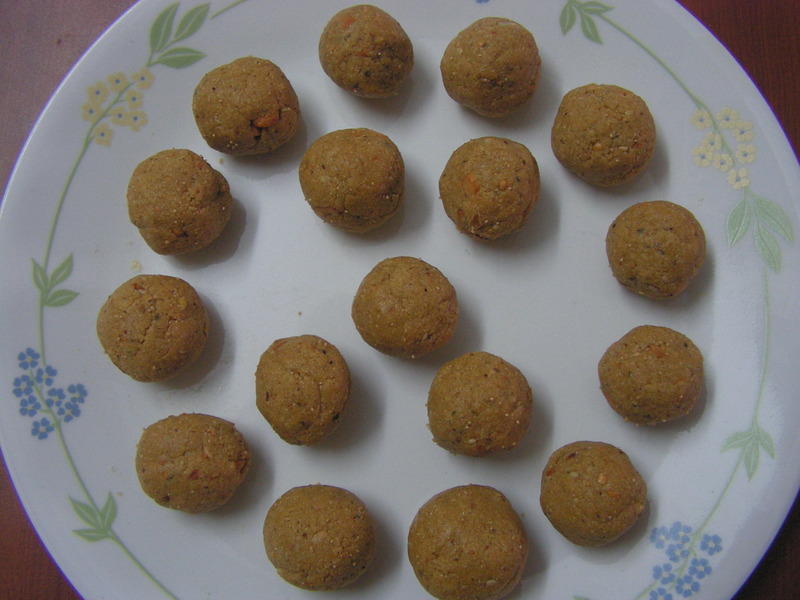 This entry was posted in Uncategorized and tagged Festival food, Festivals, Laddoos. The name itself suggests this is going to be not sweet but simple. 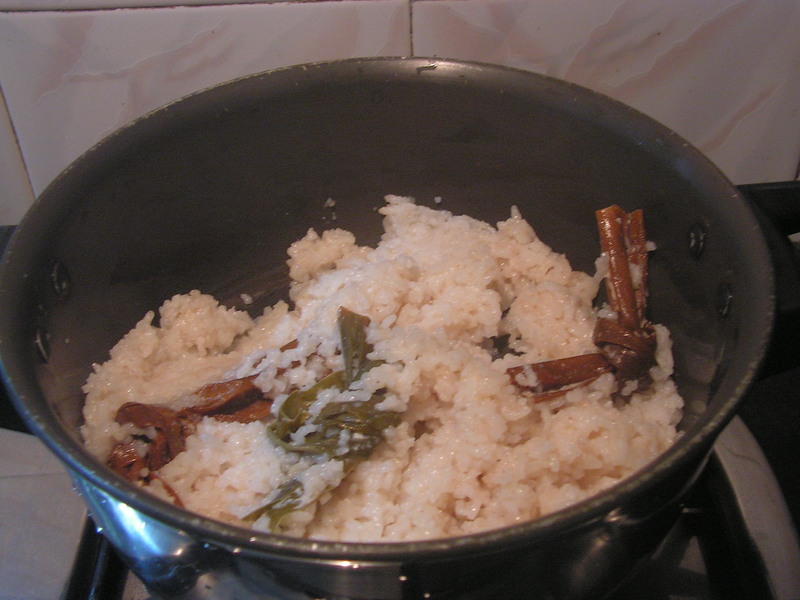 This dish is prepared for Ganesh chathurthi and Navarathri ceremonies in GSB Konkani families. Now although people use Basmati rice for this dish, in my experience this is probably not ideal. The aroma from fresh turmeric leaves gets lost amidst the strong aroma from the rice. 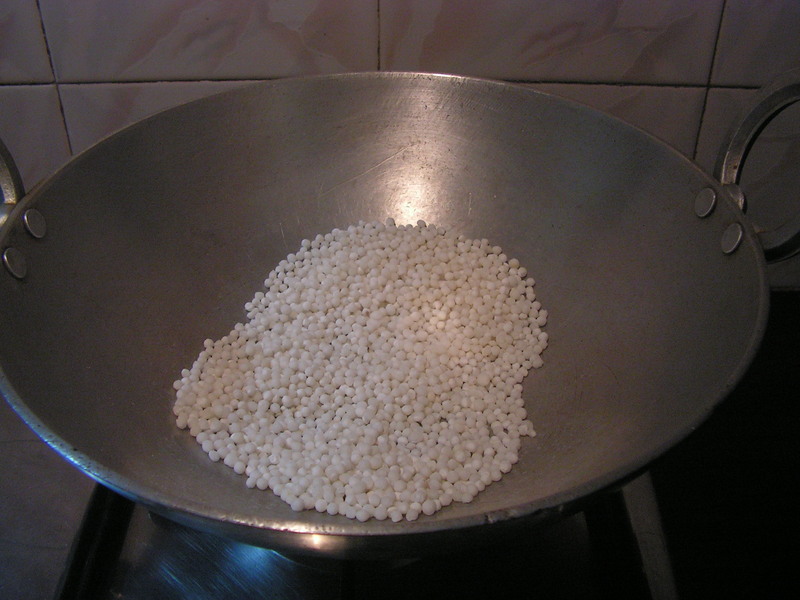 I therefore use regular Sona Masoorie rice. I encourage you to try each of these and see what you like! 1. 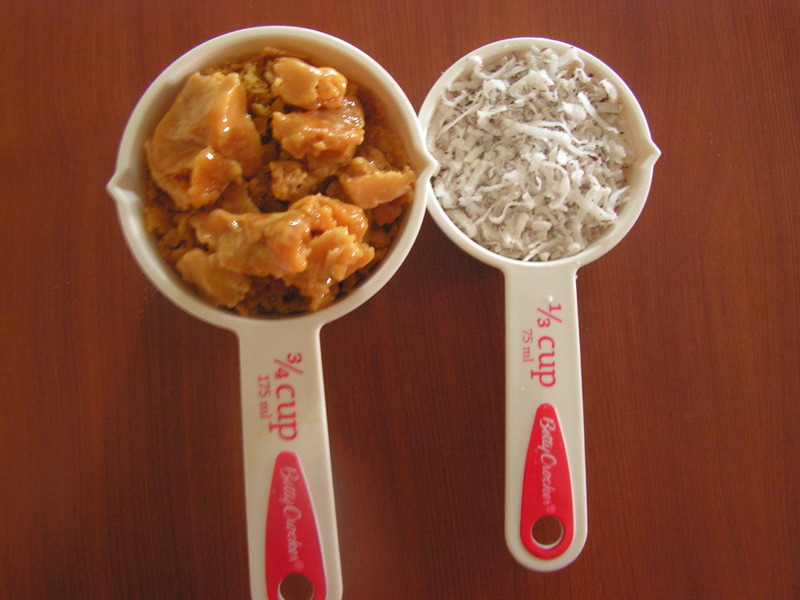 Grind fresh grated coconut adding water in steps to a fine consistency and strain through a strainer. Extract the concentrate milk and keep it aside. 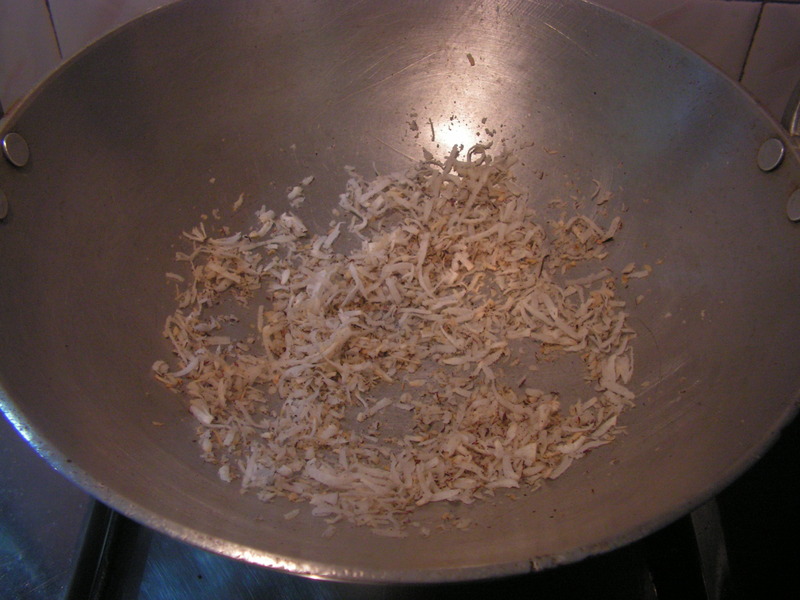 Again grind the residue in the mixi adding water in steps to grind and extract the dilute coconut milk. Strain it keep it aside. 3. 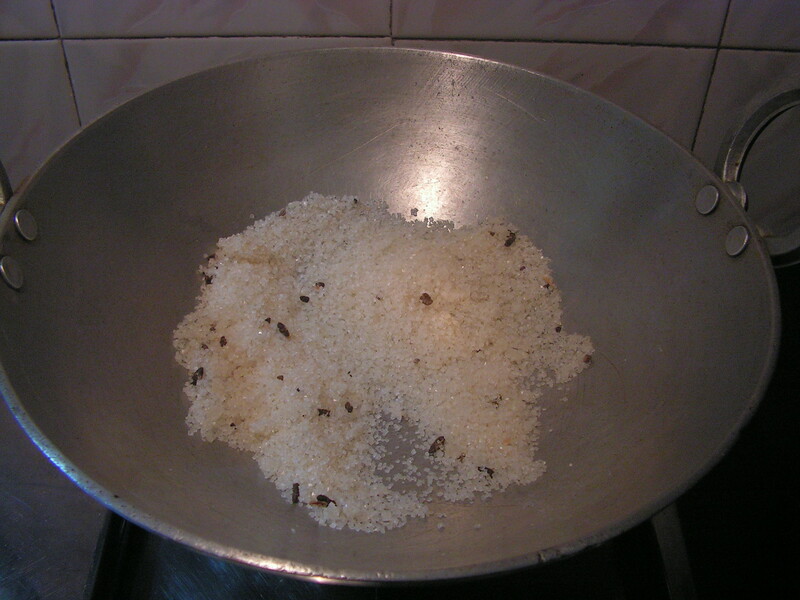 Transfer cooked rice from the cooker and transfer it to wide bowl. 4. 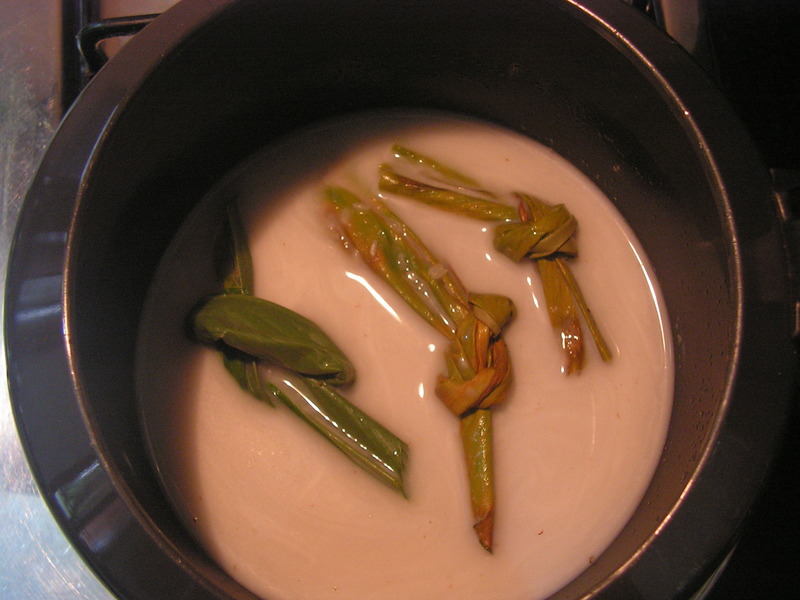 Add the concentrated coconut milk from step 1 to it and bring it to boil on low flame bringing it to the right consistency. 5. Transfer it to a bowl for a closer view of the dish. Some like to enjoy with a pinch of salt and some relish it with a tangy dish like the menskai. 1. 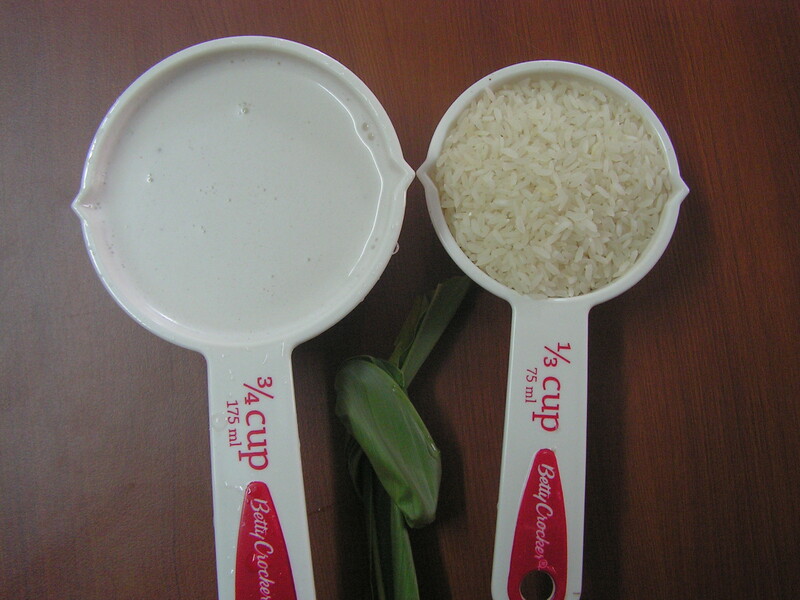 Rice has to be overcooked for better flavor and also to thicken the dish after adding the coconut milk. 2. I used coconut from my garden. 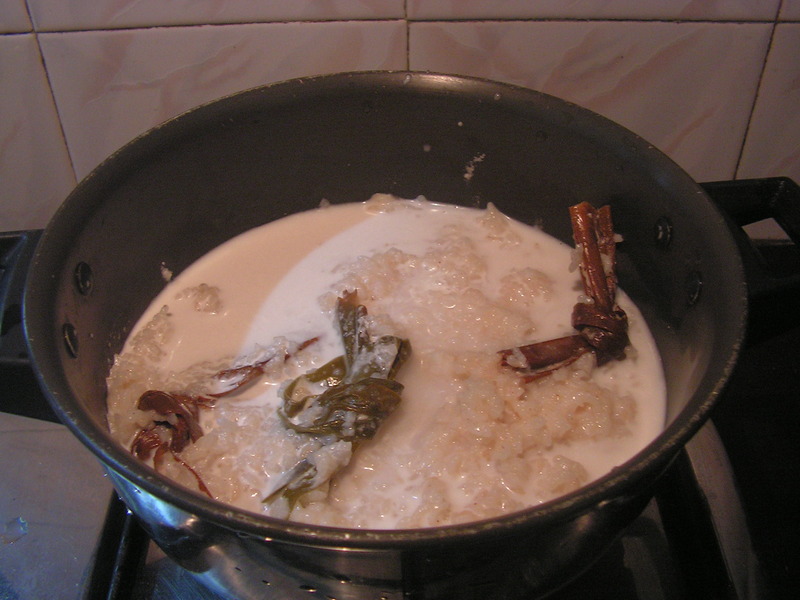 If you are extracting coconut milk on your own do not try it with a typical dry coconut. Insist on buying Bannangai – Kannada word for partly ripe coconut – when you shop. 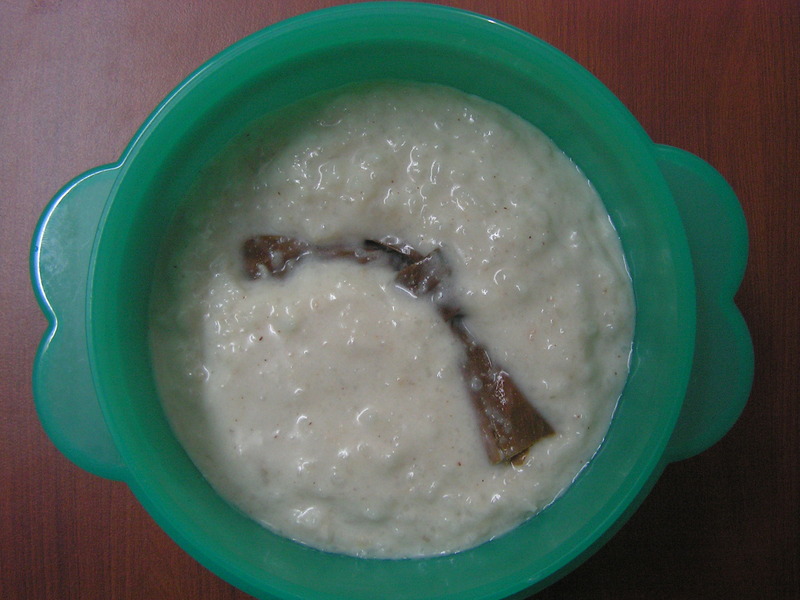 This entry was posted in Uncategorized and tagged Festival food, Ganesh chathurthi special. 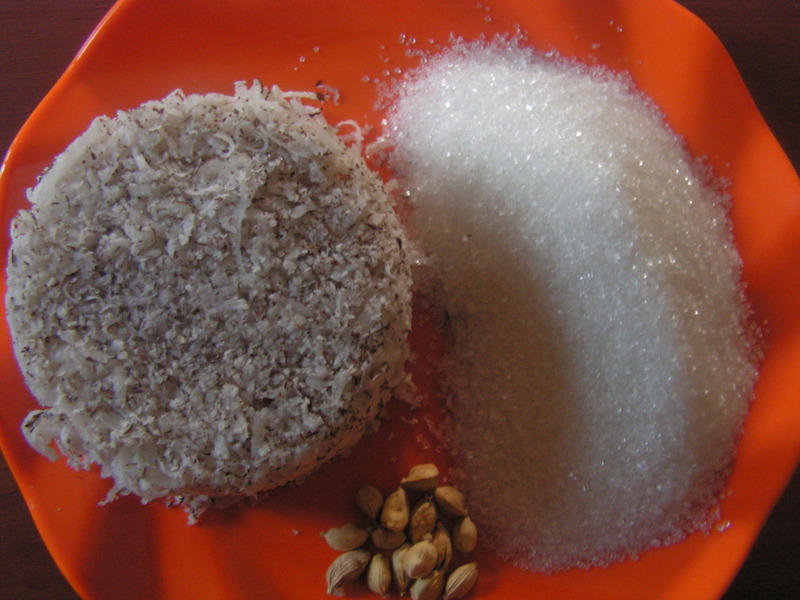 Copra/Kobbari is dry coconut. 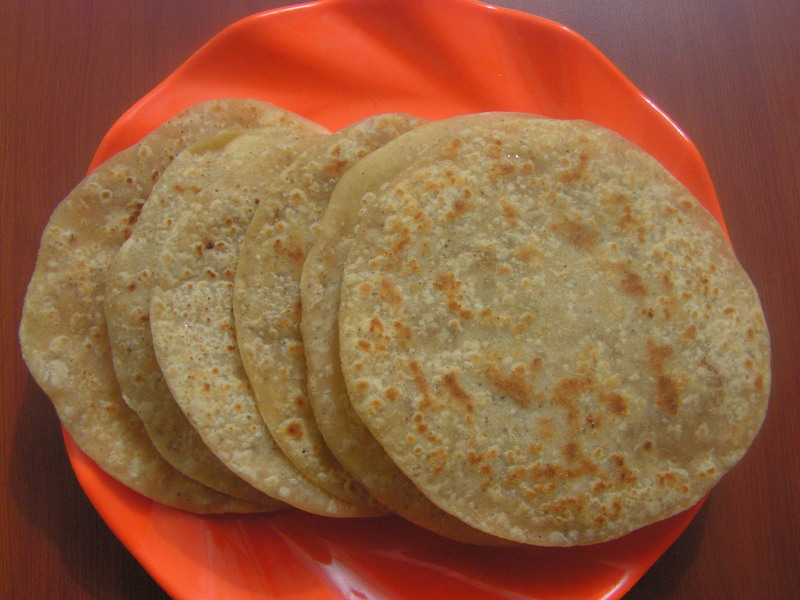 On the other hand, Holige is stuffed sweet flat indian roti and the most popular variety is the Puran Poli. I have already put up a few of them namely Puran Poli, Toor Dal Poli, Moong Dal poli, Sweet potato poli, Sanjeera and also date poli etc. 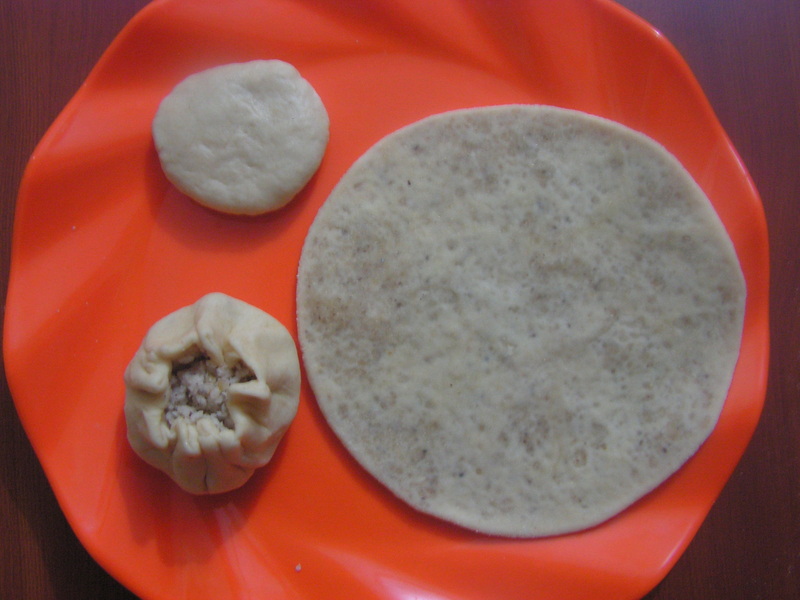 This is a variation where copra and sugar form the stuffing in this sweet roti. This is an age old recipe that I borrowed from my mom-in-law. 1. Sieve atta and maida in the siever with salt and make a paliable dough adding water in steps. 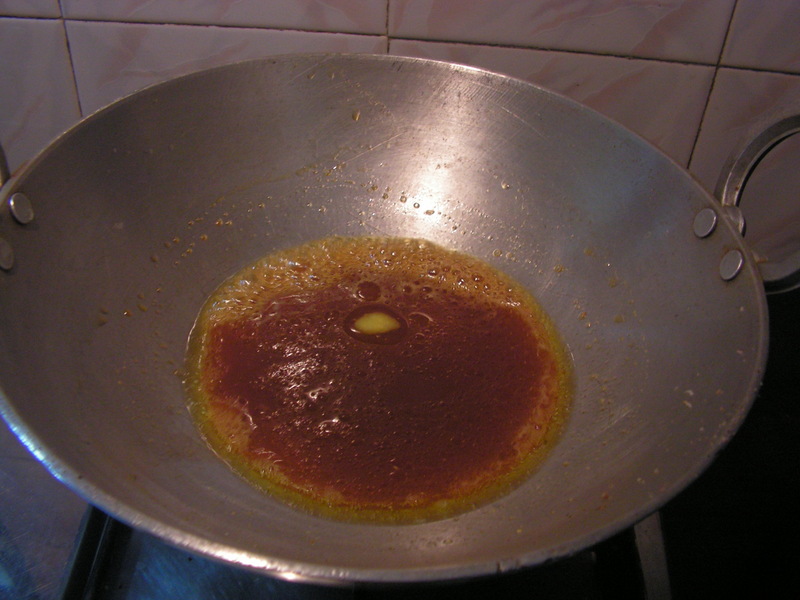 Later on add cooking raw oil slowly and add a little oil to it on top of it and let it rest for about an hour. 2. 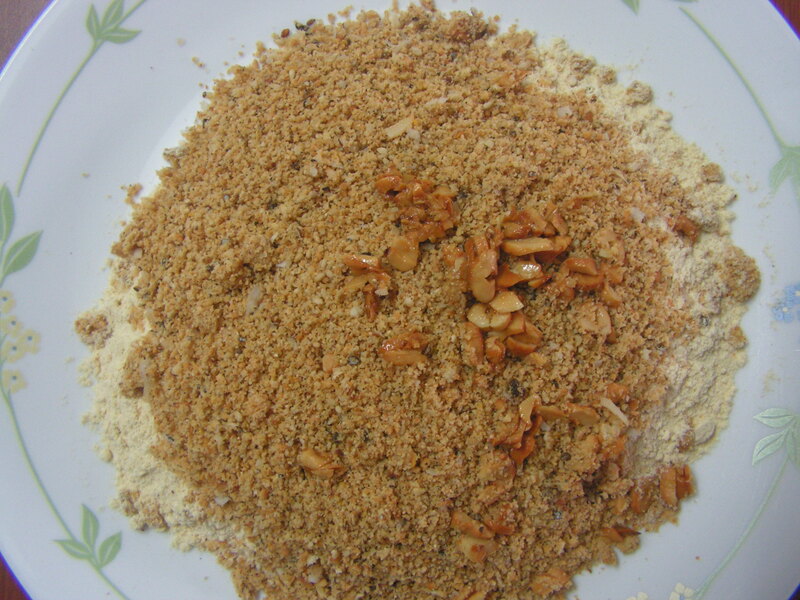 Powder grated copra, almonds, walnuts & sugar in the mixer to a medium fine consistency with cardamom and keep it aside as shown above. 3. 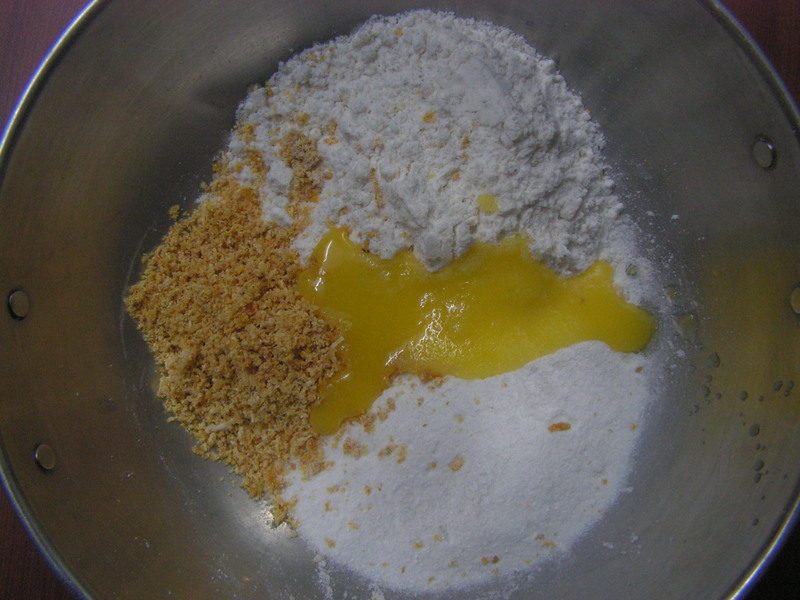 Make lemon size balls with the mixture and place it aside as shown in the image below. 3. 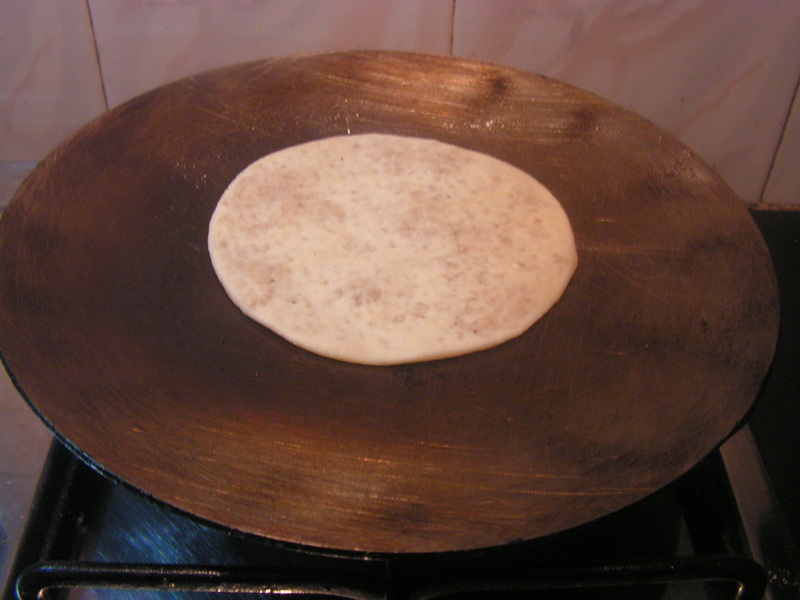 Pinch out the required quantity of the dough and knead it well and roll it into a small disc and place the copra sugar mixture ball in it (one may even powder it if can not close it properly) and close the edges tight and roll it very lightly with the roller to required thickness so that the mixture spreads through out the roti as shown below. 4. Place a chapati tawa on medium flame. When heated splash a little ghee while placing the rolled roti on it. Flip it and roast till brown dots appear on it and it is done. 5. Repeat the same process for rest of the dough. When cooled stre it in an air tight container. Remains for more than 15 days. 1. 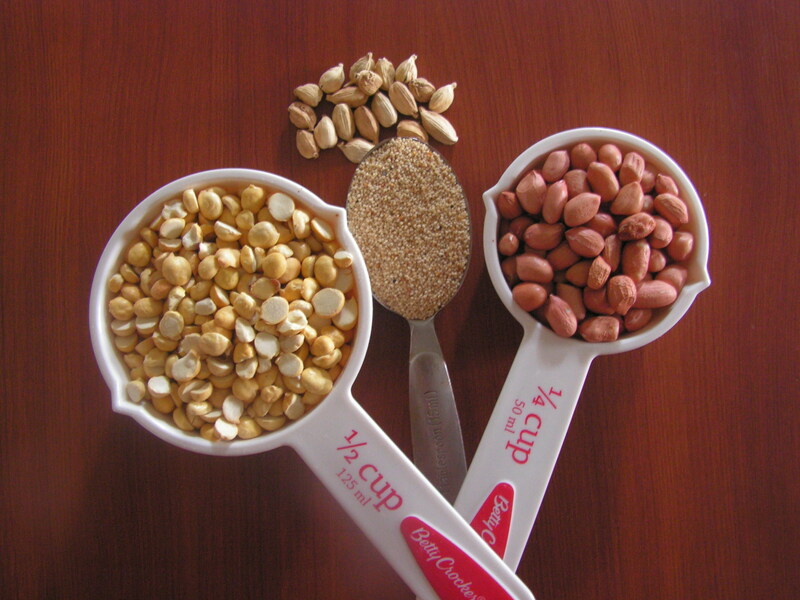 Copra should be grated and sugar should be powdered in the mixer to a medium coarse consistency with dry fruits. 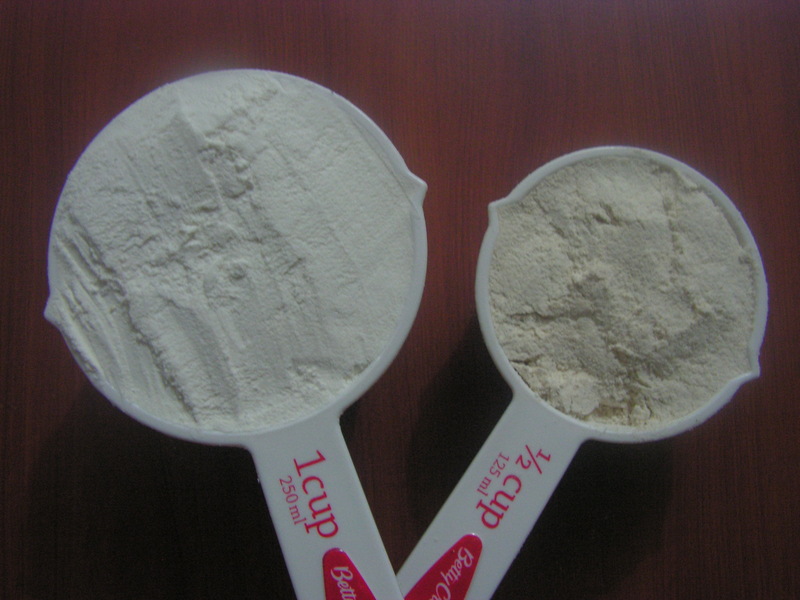 Dry copra should be a best option. 2. 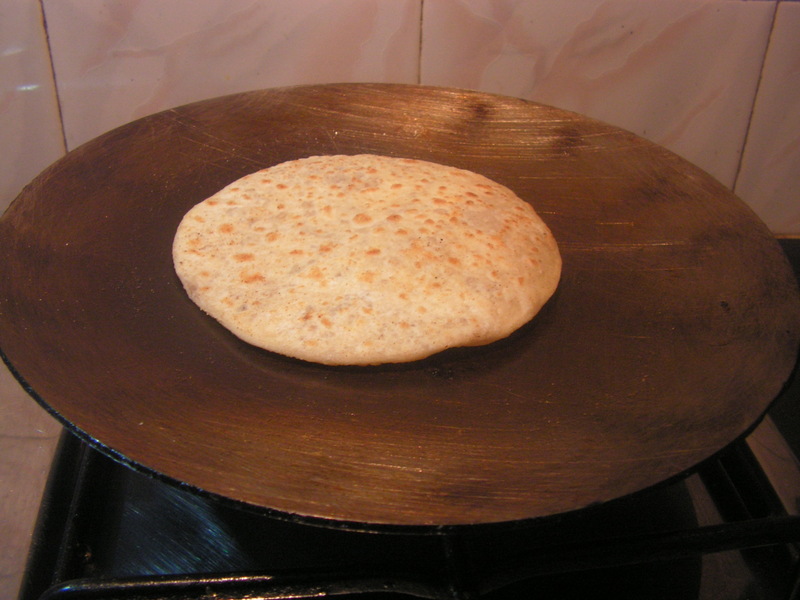 Rolling the roti once the filling is placed is very important. 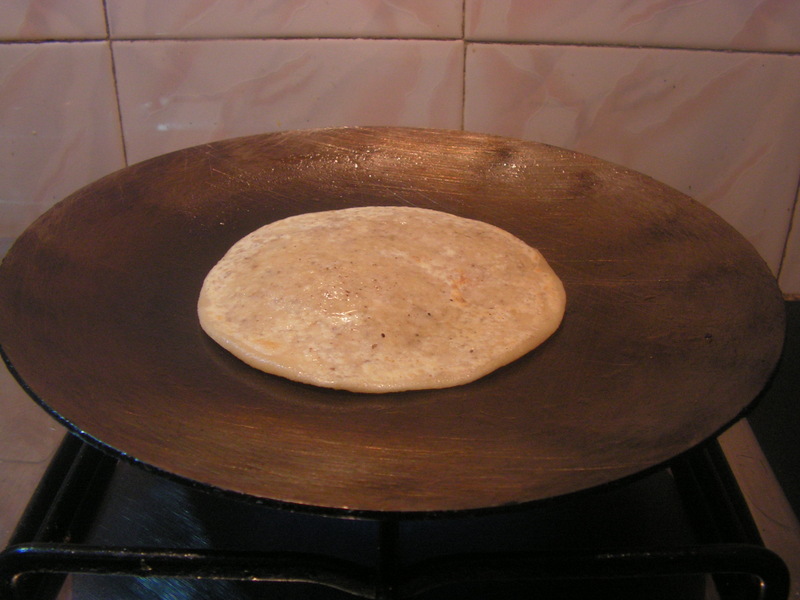 One needs to be careful so that the stuffing should be spread even throughout the roti else the outer dough will remain on the edges making the roti a little hard. 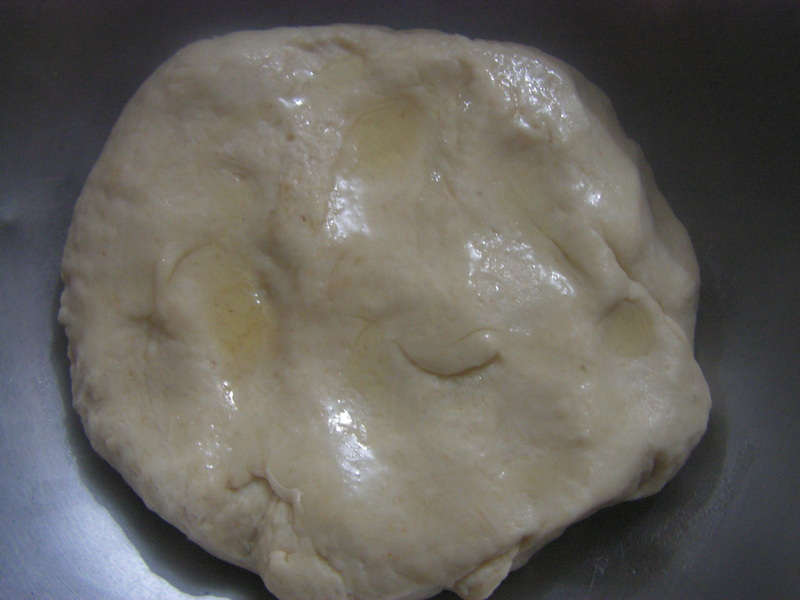 The outer dough itself should be well-kneaded. 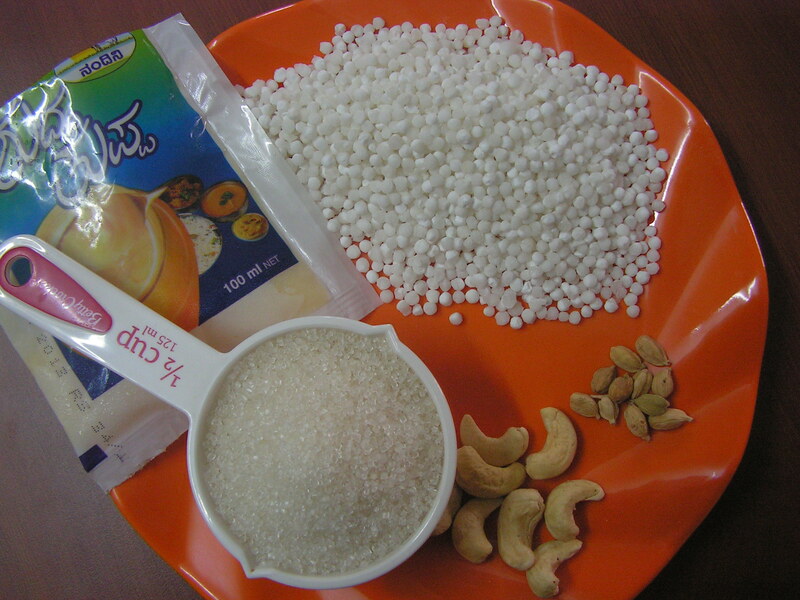 This entry was posted in Uncategorized and tagged Festival food, Poli, Sweets.